If you look at the Current Issue page on the website, you will see a beautiful cover by Saskatchewan artist Joel Hustak. Kevin Cockle and Marcelle Dubé and Suzanne Church make a return to our pages, and we are pleased to present new names to On Spec readers: Meghan Casey, Ashley Mullins, Christine S.R. Jackson, Brent Nichols, and William Squirrell. Poetry by Emeniano Somoza and Michelle Chen, interviews by Roberta Laurie and Cat McDonald, and an editorial by Barb Galler-Smith complete the issue. Copies are available by mail, or from Variant Edition Comics & Culture and Happy Harbor Comics in Edmonton. We will be at upcoming events such as the Royal Bison Craft Fair in Edmonton (May), Vul-Con in Vulcan, Alberta (July) and the When Words Collide festival in Calgary (August). Digital versions of many of our issues can be obtained through Weightless Books. We are pleased to announce that, thanks to the Alberta government’s generous support of Alberta’s book publishing industry, Tyche Books has told us that “Casserole Diplomacy and other Stories: an On Spec 25th Anniversary Retrospective” is available as an ebook through public libraries across Alberta! Check your local library to see how this book can be accessed. For those new to On Spec, “Casserole Diplomacy” is a collection of editor-selected stories to celebrate 25 years of On Spec in Canada. For more information about the Read Alberta E-book Project, click here. We’ve been told that some writers tried to submit stories last night within the deadline, or so they thought. However, they found the link to Submittable for Short Fiction had been removed. It appears that Submittable may have cut off submissions at midnight Eastern time, which left a lot of people out of luck. If you were one of them (and we rely on your honesty!) , please contact us by Friday, Febrary 3 at onspec@onspec.ca. As 2016 comes to a close, we at On Spec want to thank our loyal readers and subscribers for their ongoing support. Thanks go out also to the wonderful people who purchased seasonal gift subscriptions for their friends and family members. We are looking forward to new opportunities to bring On Spec to a wider audience in the coming year. We would like to take this time to remind you that our free Teacher Toolkit is available for download. If you are or if you know a middle-grade English or Language Arts teacher, we offer a complete lesson plan to teach the story “Space Monkeys” by Ryan M. Williams. From all of us to all of you, our very best wishes of the season! Peace and goodwill to all. After a long gap, we are once again ready to read new works of fiction. Between December 15, 2016 and January 31, 2017, you will be able to follow the link on On Spec’s Submissions page, and send us your very best short speculative fiction for consideration. With the disclaimer that On Spec is volunteer-run, and so nothing happens overnight, we will do our utmost to ensure your work is read with respect and care. If we can make any constructive comments on works that are declined, it means that we see some potential, but just haven’t the resources to work with you to make a story publishable. That’s your job. Best wishes to you all for a peaceful and happy holiday season, as we celebrate the solstice in our own ways. The World Fantasy 2016 Convention was held last week in Columbus, Ohio, and the awards for the best in the genre were given out. We were very pleased to see that a lifetime achievement award was given posthumously, to David G. Hartwell. Congratulations go to all the short-listed works and especially to the winners. Congrats to all the Hugo Winners! 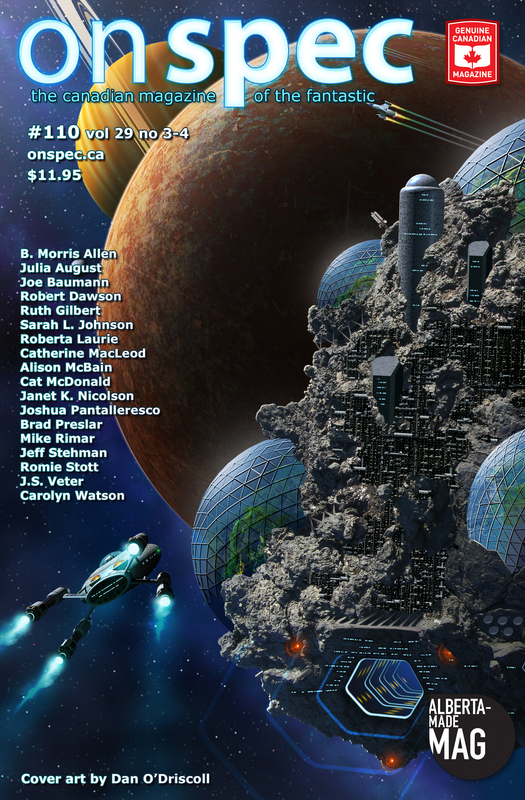 On Spec sends its congratulations to all the nominees and winners of the Hugo Awards. Several of us were at last year’s ceremony, and watched as the voters showed their disapproval of the attempt to hijack the process with a slate of “puppy-approved” nominees. While last year, perhaps “no award” was all we could do in most categories, this year’s winners deserved the prize, and showed that the fans have a much stronger voice than the people who want to destroy the Hugos. Diversity and excellence in the genre won last night. Congratulations to all. Several of On Spec‘s editors were at the annual When Words Collide festival of genre fiction writers and readers , held at Calgary’s Delta South hotel over the weekend. There was a stunning array of panel discussions, and a host of talented writers, editors and creators. It gave us a chance to reunite with old friends and meet some new ones. And Randy McCharles and his crew of volunteers continue to give us one of the best events in Canada for writers and readers to connect. During a podcast interview on Sunday, I was (mildly) taken to task for neglecting to push On Spec as much as possible in the area of social media. We always say that we depend on our readers and writers to spread the word about On Spec, but it’s also our responsibility to ensure there are opportunities made to encourage this. Once thing the interviewer (and we’ll post a link when it is available on the web) pointed out was that we seldom really push for new donors to our Patreon campaign. We are grateful for the monthly gifts from our supporters, and currently we receive approximately enough each month to buy a story and a couple of poems. But that support has not grown at all in many months. In a perfect world, with a combination of subscription and sales and ad revenues, plus Patreon donors, and individual gifts, we’d have enough to sustain On Spec for many years to come, and allow us to make actual plans, rather than constantly scrambling to make ends meet. As shown by past events, we cannot depend on government funding forever. So with that in mind, I am once again reaching out to people who have shown some interest in On Spec, by subscribing to this list. If you are at all interested in ensuring On Spec‘s continued existence, over and above paying lip service, we’d be ever so grateful if you either subscribed, made a gift of On Spec to your local library or high school, or dropped a dollar or two a month to help us through Patreon. The links are available on our website. You could also make a one time donation by cheque or PayPal. And do use every opportunity you get to tell people about our magazine. Don’t assume that everyone already knows about us. If you’ve ever had a story, poem or artwork in On Spec, please remember that we’d love to post a photo showing you holding up the issue(s) your work appeared in. A new issue of On Spec has recently gone to our designer, so once the design, proofing and printing is done, it will be in the hands of our subscribers. We will likely open to new submissions of fiction later in the fall. Our next appearance will be at the Edmonton Comic and Entertainment Expo in September, and we also look forward to organizing some Edmonton events for writers and readers in a partnership with the good folks at Variant Edition Comics & Culture during the winter months. On Spec at VulCon 2016! We’ve been looking at our schedule and suddenly July is nearly upon us! What in the world is a person to do with July? There are the usual festivals with parade and such, family BBQs and camping, and shopping, sightseeing, visiting with friends, going to a museum, and meeting celebrities, artists and the warmest “locals”! Yes, you could do ALL of those things in one great place–Vulcan, Alberta on July 9-10, 2016. You could be in one of the most wonderful small towns in Alberta that weekend for VUL-CON–a Star Trek gathering with other sorts of extravaganza things to do and see! On Spec will be there for the second time. We went last year and had an amazing time. Small crowds meant we had some super quality time with artists, vendors of all kinds (including the ladies who had so many great knitted items with logos of our favourite superheroes, the local animal shelter, a life sized Spock, and SO much more! In town there’s the Trekcetera Museum–more than just Trek and the collection is fabulous. Costumes and memorabilia galore! Spend some time at the Trek Station information centre and marvel at the solar panelled structure that powers it. If this sounds like an ad for the town of Vulcan, the Trekcetera museum and the Vul-Con convention, you’re right. The people are warm, friendly, and have all the best parts of being a small town. We love Vulcan. On Spec will be there July 9-10, 2016 having a blast!